Kimber Moreland with the accelerator mass spectrometry (AMS) instrument. Photo courtesy of Lawrence Livermore National Lab: LLNL-PHOTO-769483. Under the leadership of Professors Asmeret Berhe and Stephen Hart, three UC Merced Environmental Systems (ES) graduate students have been awarded fellowships from the U.S. Department of Energy (DOE) to advance their doctoral theses. The DOE’s Office of Science Graduate Student Research Program (SCGSR) provides students with thesis research opportunities at DOE national laboratories. The fellowships are designed to allow science, technology, engineering and math (STEM) graduate students to utilize the resources available at national laboratory sites, such as equipment and the expertise of DOE laboratory scientists. Most fellows remain at a site for three to 12 months. In order to apply, graduate students must provide a SCGSR research proposal in partnership with a DOE laboratory research scientist, and in collaboration with their graduate thesis advisor. 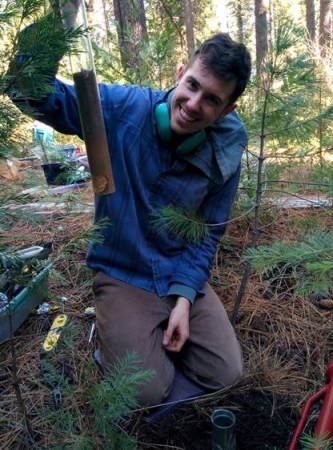 Nicholas Dove’s fellowship at Lawrence Berkeley National Laboratory — which took place from October 2017 to August 2018 — included research on soil microbial ecology of the critical zone in a warmer world. Using state-of-the-art techniques, he sequenced and analyzed microbial DNA from a 4 1/2-year warming experiment to determine interactions among temperature, soil nutrients and microorganisms. Nicholas Dove with a soil core sampled during his study. 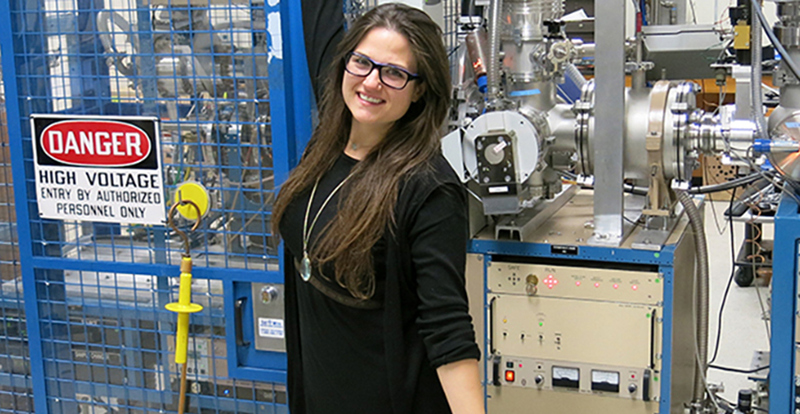 Kimber Moreland is midway through her two-year fellowship at Lawrence Livermore National Lab, which ends in April 2020. She is researching climatic controls on deep soil organic carbon dynamics using accelerator mass spectrometry (AMS). She will analyze how the radiocarbon age of soil changes with climate and depth. Moreland said she’s delighted to become a trained compact AMS operator, as there are only a few AMS’s on the planet. She trains closely with Karis McFarlane at the lab’s Center for AMS on sample prep, AMS runs, modeling and interpretation of data. “It has been an opportunity of a lifetime to explore my research at the national lab,” she said. “I feel like my success is everyone’s success here, creating a very collaborative and rich learning environment.” Moreland is applying for a lab grant to continue her post-doctoral work at the same lab. 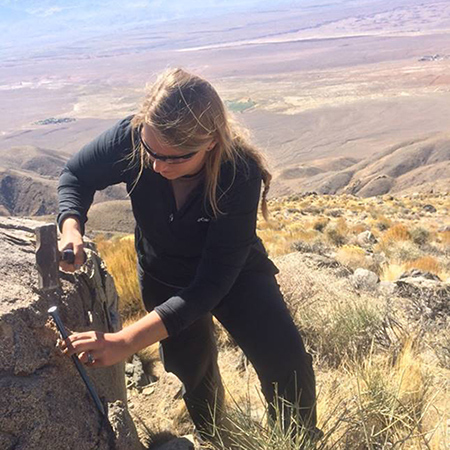 Morgan Barnes collecting rock samples in the White Mountains (California). The Pacific Northwest National Lab in Richland, Wash., is hosting Morgan Barnes until July. Barnes is working with expert scientists and answering her research questions about soil organic phosphorus. Phosphorus is an essential element that regulates key ecosystem services and development, and it is predicted to become the primary limiting nutrient in terrestrial ecosystems. Barnes is researching phosphorus speciation, abundance and ecosystem implications in a warming environment using advanced spectroscopy, mass spectrometry and X-ray technology. “I am excited to learn about how these advanced tools work, and their capabilities for other projects moving forward,” Barnes said.